A cyclist struck and killed in East Harlem Monday night has yet to be identified pending notification of relatives, according to NYPD, while details of the crash remain uncertain and may not be known for months. 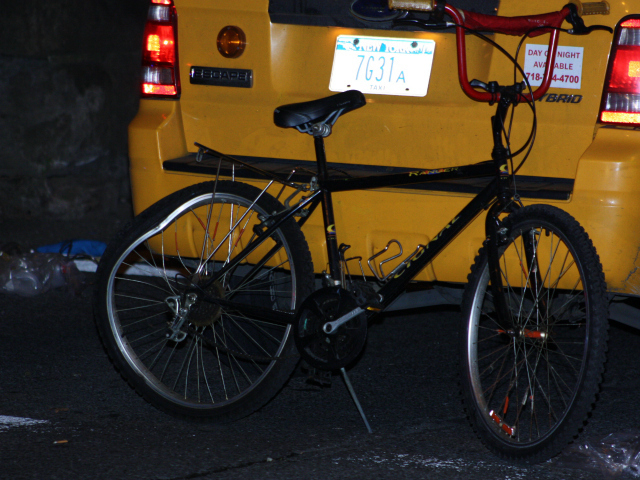 Information provided by NYPD to both Streetsblog and Gothamist, however, indicates that the cyclist was traveling westbound on E. 108th (which is one-way eastbound) when he was hit by the cabbie, who was southbound on Park. The spokesperson we talked to described the crash as a “t-bone situation.” The cyclist’s age was reported by Gothamist and DNAinfo as 19, while NYPD told Streetsblog he was 18. The bicyclist was hurt, but he was still breathing and conscious when an ambulance arrived to take him to Mount Sinai Hospital, the FDNY spokesman said. He was not likely to die, the spokesman said. Though this information was obtained from FDNY, in NYPD parlance the phrase “not likely to die” translates to no involvement from the Accident Investigation Squad, the only officers on the force qualified to conduct investigations of serious traffic crashes. When Streetsblog called today to get the name of the victim, the department’s public information office did not know the cyclist had died, but a spokesperson said AIS was dispatched to the scene at the time of the crash. NYPD customarily guards information on traffic crashes as if it were a matter of state security. If past patterns hold it will take a freedom of information request and months of waiting before specifics on the latest Manhattan cyclist fatality can be made public. As of this morning, the official word from NYPD concerning Monday’s crash is “no criminality suspected,” meaning the cab driver was not intoxicated and remained at the scene. If the circumstances are as you describe them, Brad, then the cyclist would have passed under the railroad viaduct before being hit by the cab. The opaque stone viaduct blocks the view of crosstown traffic from Park Avenue, and vice versa. Park Avenue should be narrowed and a curb installed on both sides of the viaduct, so crosstown traffic can emerge safely from underneath the tunnel to see, and be seen by, oncoming traffic. That’s not a typical T-Bone accident, judging by the photo. N.B. the only damage is in the rear of the bike beyond the rear triangle. The obvious damage is to the wheel and the rear carrier. The carrier was obviously pushed upward towards the front of the frame. A side blow would not have pushed it upward. The rear wheel obviously suffered a direct impact blow. The rim is severely dented – not just distorted like a taco. From my vantage point some 13 miles and several days removed from the crash site, a rear end impact is most consistent with the damage I see in the picture. I got rear-ended and had similar damage to my bike. I didn’t even realize that my wheel was bent at first. It was kinda scary . . . I was lifted into the air by this guy driving in the bike lane. To think, people like that drive around with impunity. I bet money, this death was avoidable but for the driver not paying attention as he drove. Any witnesses who will corroborate that the taxi had the green light? I’m somewhat skeptical of that claim if the driver is the only witness here. If line of sight is blocked by a stone viaduct as Jonathan R says, few cyclists would dare run a red light. There is a similar situation local to me at the LIE underpass at Utopia Parkway. The rare times I get caught at that light I just wait it out because running it would be practically suicidal given that I’ll be emerging into a 40+ mph traffic lane unable to see if anything is coming. It looks to me like the cyclist had the green, didn’t expect cross traffic, and then suddenly turned right in an attempt to avoid the oncoming taxi running a red light. That would be consistent with the damage to the bike, which indicates a rear-end collision. The same could have happened if the cyclist ran the light, but my gut feeling here is that didn’t occur. Few cyclists are dumb enough to run a light when they can’t see what’s coming. Noting that this is very sad no matter how it played out; that no one deserves to die; assuming that the cab was indeed going south on Park and the cyclist west on 108th, (from behind the blind corner under the viaduct); also assuming that, benefit of the doubt given to the driver, he didn’t run a red light (and, critically, the cyclist DID make that error, a far worse mistake than the salmoning)…I don’t see anything to get particularly alarmed about here, other than the NYPD (as usual) being really aloof at the scene of a horrendous injury to a vulnerable road user. This is one of the few fatal road incidents where the driver can be excused. In regards to the cyclist’s behavior, it is highly uncommon for cyclists to be downright suicidal, but this seems like one of those instances of a cyclist taking small liberties in erroneous street usage without understanding the risks involved. It’s not universal but it’s not rare either.Again, this is why we have to educate folks to not just ride around how they feel like it. Many of us do understand this (unlike what most newspaper quotes would have you believe) but there are so many untrained cyclists who do not understand, and they need our help. I tend to think that speculation as to who is to blame is a bit insensitive here. The last time I got hit by a car while on my bike I was riding with traffic, with a green light…as in, doing nothing wrong, and I still got hit pretty hard – and very lucky to walk away. My point being that sometimes cyclists do risky things and get away with it, sometimes it leads to tragedy. But more often than not, we’re seeing motorists driving recklessly, carelessly, and too fast, which is leading to the death of cyclists and pedestrians at an alarming rate.